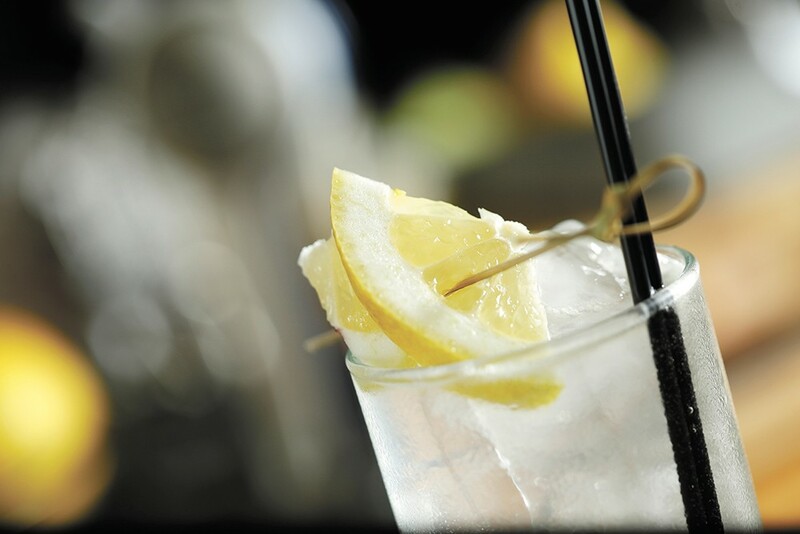 A Tom Collins at Ruins is, essentially, a slightly watered-down version of a French 75. Lots of people hate gin. To these haters, gin tastes like a Christmas tree, or something equally unpalatable. I am, proudly, not one of those people. But up until about a year ago, I had no idea what I was missing. I've always been more of a beer drinker, yet now I find myself ordering up crisp and citrusy gin cocktails at every opportunity. Gin — for those as unfamiliar as I was — is a neutral spirit infused with botanicals, the main being piney juniper berry (the source of its signature evergreen taste). Made popular in London during the 18th and 19th centuries, gin's history includes its reign as the commoners' cheap liquor of choice, followed by a return to respectable prominence when it was found to make quinine, a malaria remedy, more palatable. Thus the gin and tonic was born, with gin, sugar, lime and ice added to mask quinine's bitter taste. Gin has since enjoyed a long and steady revival, including its inclusion in the classic martini, and in 007's favorite, the Vesper. Here are some of my favorite gin drinks, and favorite places to enjoy them. A regular on the menu at Clover's award-winning bar, the Corpse Reviver No. 2 is the drink that kicked off my gin journey more than a year ago. Its curiously dark name and listing as the first drink under the "crisp" heading on Clover's cocktail list piqued my interest, and I was not disappointed. Truly a cocktail to raise the dead — it was made famous in the 1930s as a "hair of the dog" morning-after drink — the Corpse Reviver's stout contents — gin, triple sec, Lillet, lemon juice and a splash of absinthe — make it a one-and-done drink for all the lightweights out there. I now order this drink again and again for sentimentality, though my fellow gin connoisseurs should also take note of the sheer number of gin cocktails on Clover's list, including many classics — the Aviation, Vesper, Negroni, Last Word, French 75, lemon and jasmine fizzes — and a few contemporaries, like the house's Clover Club. In my quest to sample the wide variety of gin cocktails, I've naturally honed my preferences for what I do and don't like to be mixed alongside the spirit's piney, herbed notes (despite its distinct flavor characteristics, gin is an incredibly versatile spirit). Though it's considered one of the definitive gin classics, the Negroni's mix of vermouth and Campari is too bitter and warm on the tongue for my palate. Rather, my personal tastes have led me down the path to gin and juice — specifically, lemon or lime juice. I was delighted by a citrus-forward, recently revived Prohibition-era classic called The Last Word, a mix of equal parts green Chartreuse (an herbed French liqueur), Luxardo maraschino liqueur and fresh lime juice. The cloudy, pale-green mixture, served here with a slice of lime floating on top, is truly one of the most refreshing summertime (or anytime) gin drinks. Equally refreshing and summery is this counterpart to The Last Word: the gimlet, also considered one of gin's definitive classics. If you're sticking to the drink's original recipe, a true gimlet would be made of half gin and half Rose's Lime Juice Cordial, a longtime branded lime concentrate. Remedy's version (as are many other modern variations) is a little less heavy on the lime, but stays true to the cocktail's origins. With the addition of muddled basil, the drink is a shaken mixture of Broker's London Dry gin — the designation "London Dry" means no flavors were added after distillation — lime juice and agave nectar. In tandem with the gin's herby profile, the muddled basil (which, at first, almost fools me into thinking it's mint) perfectly balances out the drink's citrus and juniper notes.